Identification: Extremely variable geographically. Upperside of female brown often with orange band on outer edge of hindwing. Male blue with dark borders. Male may have orange band on outer edge of hindwing. 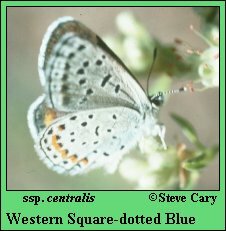 Underside is off-white to gray with black postmedian spots ranging from square to round and from large to small, again depending on subspecies. Best identified by associated host, locality, and season. Wing Span: 11/16 - 13/16 inches (1.6 - 1.7 cm). Flight: One flight; Mid-April to August depending on location and host bloom. Caterpillar Hosts: Various wild buckwheats (Eriogonum species) including coastal buckwheat and sulphur-flower. Habitat: Varies by subspecies; includes, prairie, open woodlands, chaparral, dunes, and alpine rock gardens. Range: Spotty distribution from Washington south to Baja California Norte, thence west to southern Colorado and New Mexico. Conservation: Most populations are probably secure, but invasive alien weeds such as cheatgrass may threaten an unknown proportion. NCGR: G5 - Demonstrably secure globally, though it may be quite rare in parts of its range, especially at the periphery. The Comstock's Blue (subspecies comstocki), and an unnamed subspecies all have The Nature Conservancy rank of T1 - Critically imperiled because of extreme rarity (5 or fewer occurrences, or very few remaining individuals), or because of some factor of its biology making it especially vulnerable to extinction. (Critically endangered throughout its range).